Mary is wearing the bull costume, and I (Naomi) am wearing the home-made China Shop costume. 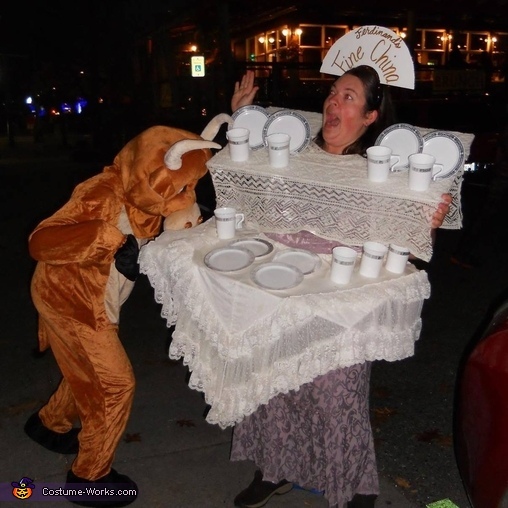 I have worn costumes to complement the bull for the last 2 years - a flower to go with Ferdinand the bull one year, and a matadora the next year. The idea of a China Shop came to us, and I created this costume for under $15. I bought the plastic "china" online, and I bought the foam board to make the shelves and sign at a discount store. The headband to attach the sign and the lace fabric and dress I had at home. I cut a hole in the top shelf just large enough for my head, and it rests on my shoulders. I cut an arch out of the lower shelf and tie it behind my back with thick elastic that I slid into small slits I made in the foam board. The lace and plates are attached to the foam board with hot glue.